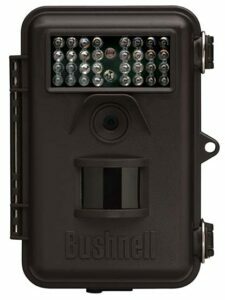 The Bushnell 8MP Trophy Cam has a lot of popular features that make it lead the world of trail cameras in certain areas. It boasts of an extremely quick trigger time, approximately 1-second. With this, you can be sure that your camera will not miss any important shots and movements in the area. One awesome feature of this camera is the “Field Scan” mode. It is a time lapse technology that will get you the big picture of your property and the wildlife patterns in it in. This option allows you to set intervals in taking photographs. You can choose to set it from one minute to one hour time interval. Because of this, you are able to cover a larger area because it will no longer wait for an animal movement to trigger it. Another good thing about this camera is the battery life. The Bushnell 8MP Trophy Cam has a battery lifespan that can last up to a year. Very impressive in comparison with other trail cams in it class. This is great especially if you live far from your hunting ground or if you do not like the hassle of changing batteries all the time. Along with a 32GB SD card, you can be sure to successfully scout through auto-pilot. This camera has an 8MP camera resolution that will certainly bring you high quality photos. It produces full color day photos and black and white night photos. A very similar option also worth looking at is the sturdy Primos Truth Cam. One set of batteries lasts up to 1 year. Note: Use of video will drastically reduce this. In conclusion, the Bushnell 8MP Trophy Cam is a perfect option for you if you want to capture all of those important movements in your area without needing to go to your hunting ground. It is small enough to conceal but will surely deliver big results to you.